I had a moment —well quite a few moments, actually— of being overwhelmed by simultaneous competing demands on my attention at the day-job yesterday. 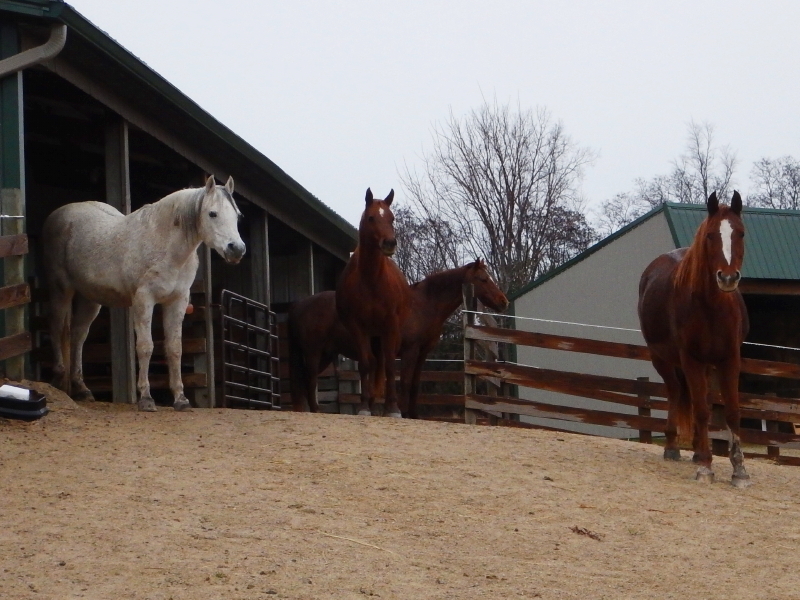 In the midst of the crazy-making, I felt an urge to be standing in the energy of our 4 horses. I think they were sending me love. I made a mental note to get myself down with them when I got home from work, rain or shine. This region has been under siege by downpours of heavy rain lately. My late departure from the cities turned out to be mostly trouble-free, both from traffic and precipitation. 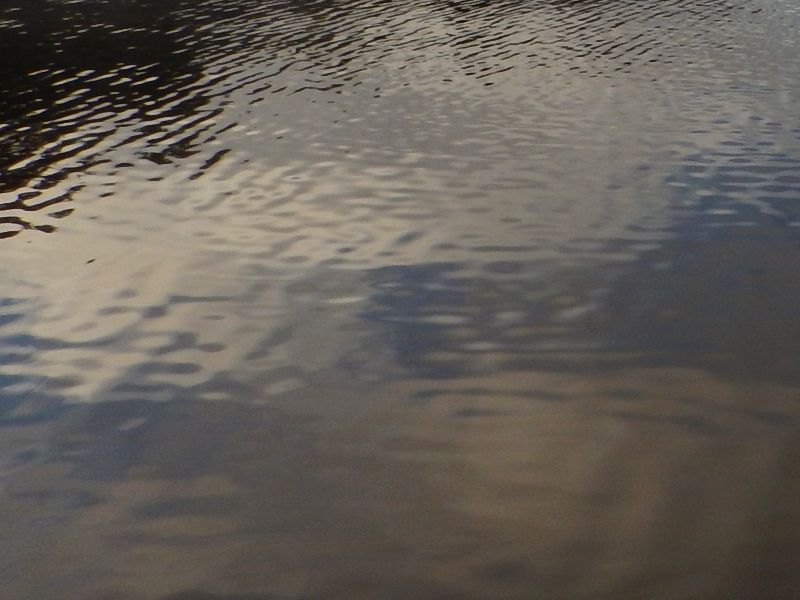 When I got within a mile of home, I spotted standing water in some of the farm fields. 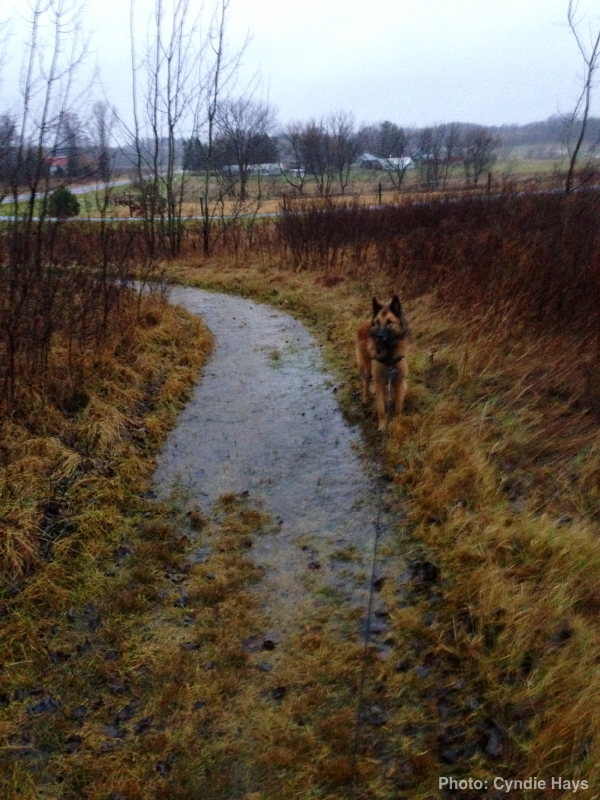 As I pulled into our driveway, I saw water running in our drainage ditch. We had obviously received a significant amount of rain just a short time before. Cyndie confirmed it had poured hard. The rain gauge contained 1.25 inches. The horses seemed entirely calm and collected with the situation. 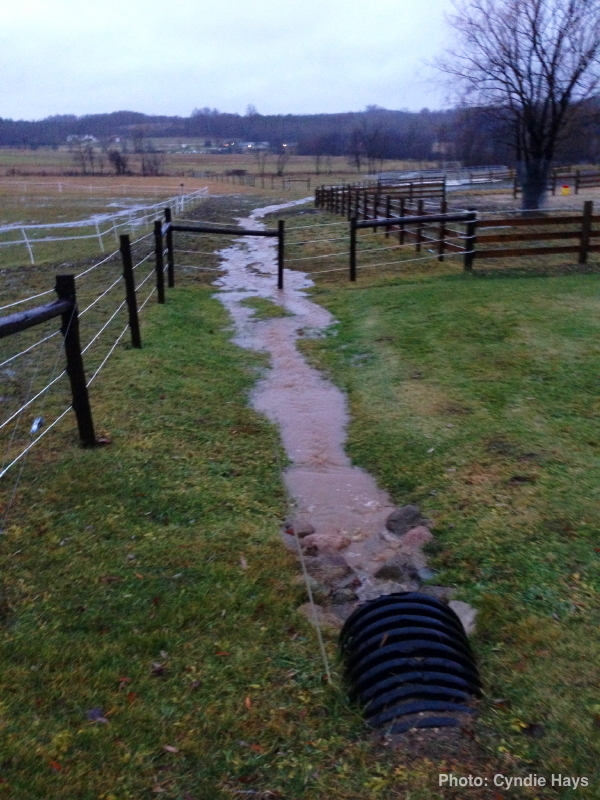 I needed to dig out a run-off route that had filled in and caused water to flow where we don’t want it to go. Working there in the paddock put me right where I wanted to be among the herd. Legacy was particularly friendly and approached me to connect in a way that seemed a little uncharacteristic of him. I think he knew it was just what I was hoping for. Standing with them, breathing, loving, and feeling loved. Horse medicine for what was ailing me. Yesterday was a beautiful day and we spent the middle hours of it in moderate traffic driving home from the lake. I don’t know why it didn’t bother me more to have driven up to that beautiful place and then experience most of the time confined indoors due to incredibly wet weather. When it finally turned nice, we were packing up and driving home. For some reason, I didn’t mind one bit. Just like that, we were home and it was back to the regular routine. I finished the day mowing our grass. The ground was completely saturated in many areas, surprisingly so in the back yard, to the point that the mower left muddy tire tracks in its wake. There is standing water in multiple places, which I needed to navigate around instead of cutting. I’m looking forward to the few days of dry weather being forecast for the beginning of this week. The signal booster I ordered last week is scheduled to arrive Wednesday. Getting it installed and calibrated will become my primary objective on Friday if the weather permits. If it works as intended, it should significantly reduce the time it takes for me to load photos and program my daily posts. I’m hoping to convert the precious freed up minutes into added sleep time. Getting more sleep will be a welcome change to my daily routine. I’m hoping my posts will begin to reflect it with a little bit less sleep-typing going on during the processsssssss. I was wrong. Turns out, the rain didn’t miss us. It was simply delayed. When it finally moved over us, it arrived with a vengeance. 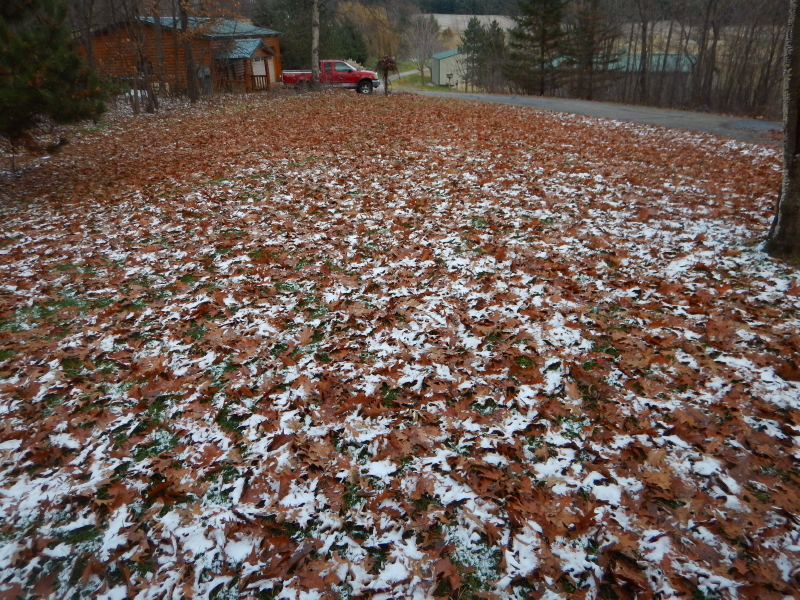 The precipitation began in the early morning hours yesterday, and thrashed down with significant gusting winds. I was awakened about a half-hour before my alarm by the tempest, allowing me a chance to lay and wonder how the horses were handling the assault. The nasty weather added unwelcome drama to my commute through the cities in the early darkness, reducing visibility to the point that most decisions become mere guess-work, while my car was shoved to and fro unexpectedly by the extreme gusting wind. The temperature hovered just above the freezing point, and throughout the day the precipitation oscillated between wet, icy, and flaky. 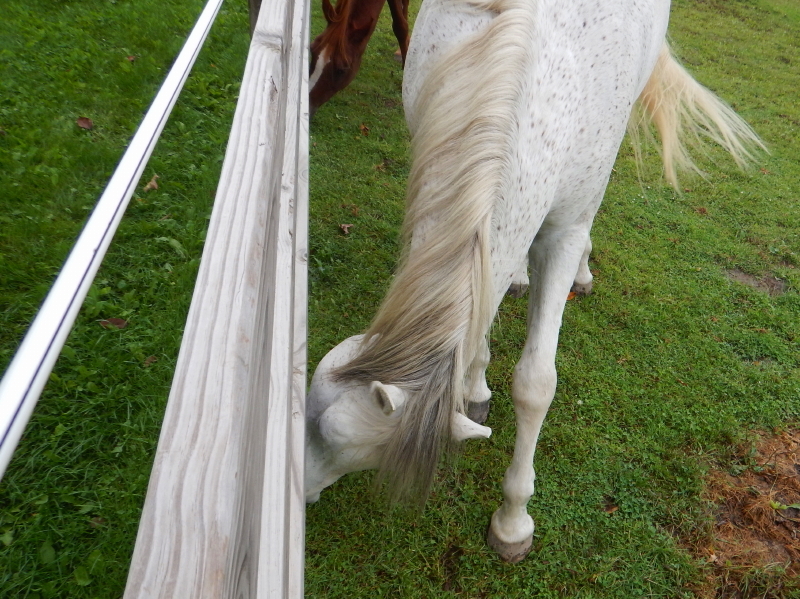 Cyndie sent me some pictures and reported that the horses were soaking wet, jumpy as heck, and shivering to beat the band when she arrived to offer the morning feed. Poor Hunter was beside himself, looking thoroughly undone and having a tizzy about getting into the barn. When he is cold and wet, the first thing he does upon entering the confined space of his stall is to lay down and roll in the wood shavings we use for bedding. It makes a scary racket, because he inevitably hits the walls with his feet in his wild gyrating. Cyndie said he successfully got himself covered with wood shavings from head to tail. By afternoon, the rain gauge had captured 2 inches. As I neared home on my return from work, I began to see water flowing in ditches that are usually dry. Every creek I crossed was spilling out beyond its banks. 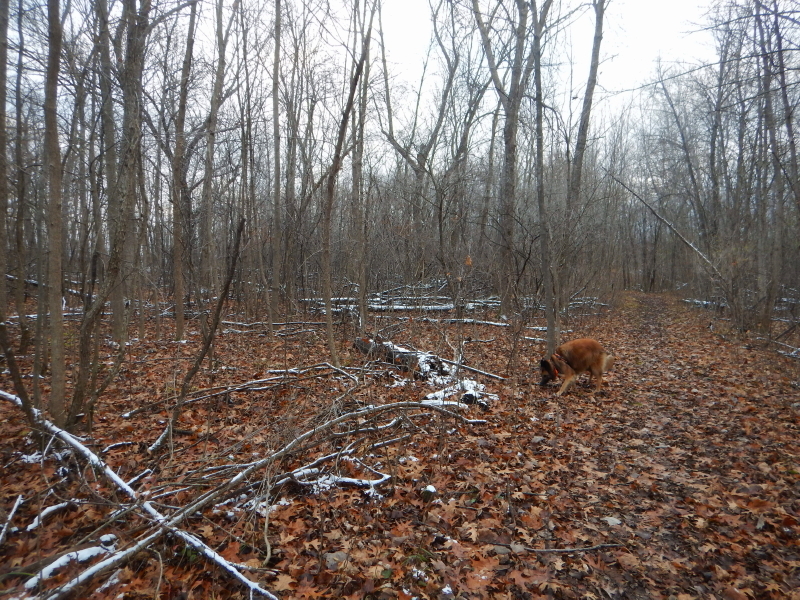 Delilah had to traipse along beside the trails in places that were under water. If we get a quick freeze, I’m afraid Cyndie will need to wear skates when she walks the dog in the days ahead. I knew it was coming, but the arrival of more rain today still feels like a bit of a shock. Our land is so, so wet. 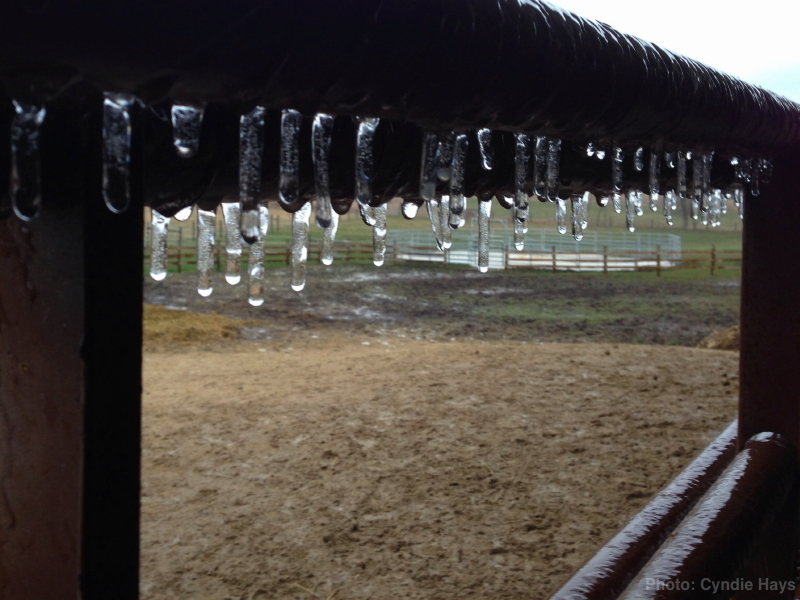 The ground is not frozen yet, creating a very spring-like mud-saster wherever our horses walk. We got some rain overnight, but had a momentary break this morning. I had forgotten to put the rain gauge out, after one of the times it actually was cold enough to freeze and I brought the glass tube in to thaw. I don’t know how much fell while we slept. 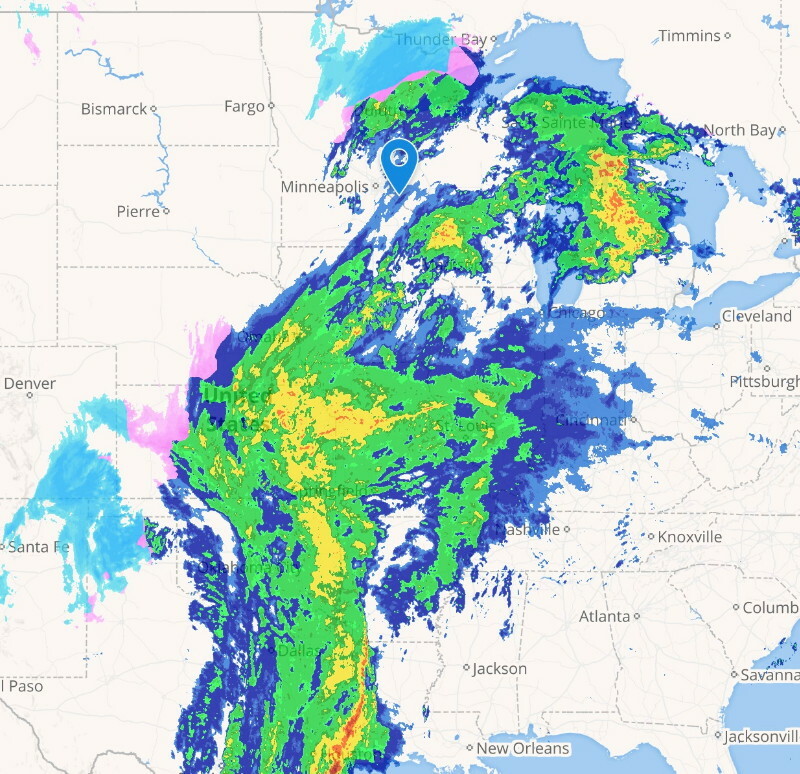 The unfortunate reality is that, as of this writing, we have much more rain on the way from the south. We are approaching the middle of December and receiving rainstorms like the middle of summer. Why, it is as if the climate is changing, or something. I saw the comment recently that we don’t need to save our planet. The planet will still be here long after the human race has gone extinct. We need to be thinking about saving ourselves! Maybe I should be building a boat. At least the herd is showing enough sense to seek the high ground this morning. The areas where we have covered the dirt with lime screenings have compacted enough now that they are performing well as intended. 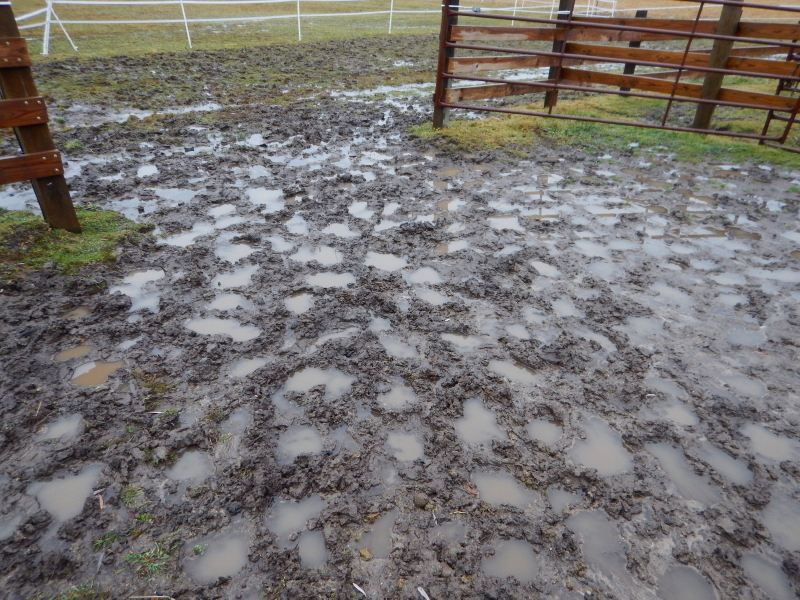 It gives the horses a chance to get out of the mud for a time. 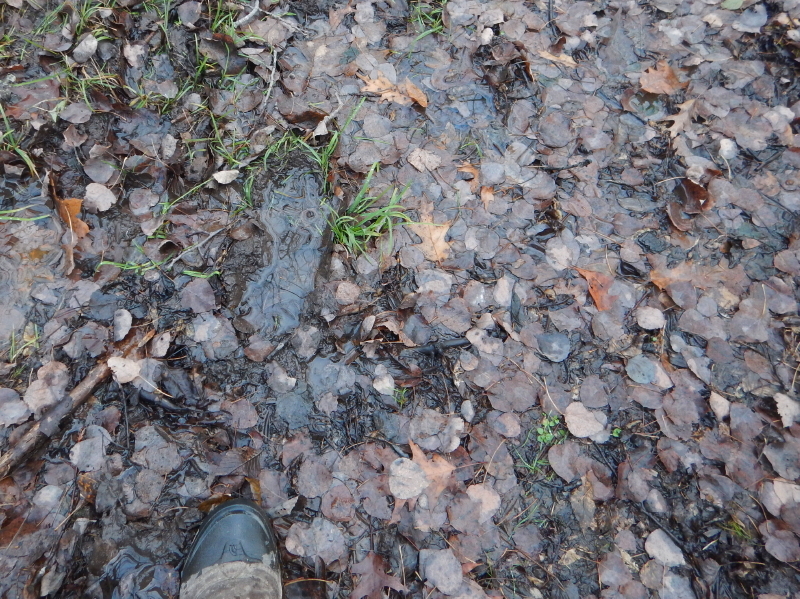 It is impressive, and sometimes scary, how far down a hoof will sink in the mud, given the approx 1000 lbs. of horse-force pushing down.